3 Free Learn Chinese Apps that Actually Work! Learning Chinese can be difficult for many westerners because, unlike Spanish or French, Chinese is completely different from English. There is no alphabet (although there is a system called pinyin), you have to recognize and pronounce tones, and the grammar can be very different. Thankfully, we live in a technological world, rich with free information and tools that can empower you to learn Chinese on your own time, anywhere, for free! (or for very small cost). We took a look at some of the most fun, bizarrely innovative, and useful free Mandarin Chinese learning apps to get you on the road to fluency. FluentU is a massive language learning web app that takes advantage of the huge amounts of Chinese language video content already on the internet. After learning new words through conversation videos followed by multiple choice questions, the FluentU system recommends some entertaining Chinese Youtube videos for you to practice your understanding. These can be anything from music videos, commercials, TV show segments, or even viral videos. This makes FluentU refreshingly entertaining and unique in its way of giving a look into Chinese culture. When you first sign up for FluentU (basic account is free) you are given the choice of one of six different levels (newbie – fluent). You can then choose between traditional or simplified characters (choose simplified unless you are interested in only living in Hong Kong). Next you can choose to learn from a series of instructional videos that teach basic conversations and vocabulary. FluentU keeps track of all the words that you have learned and mastered. This way the web app can make suggestions for which Chinese Youtube videos you should attempt to understand. After learning some words and sentences in the course content section, you can go ahead and watch various Chinese Youtube videos (anything from commercials, TV shows, or viral videos). The videos are categorized by language difficulty and by percentage of words that you already know (FluentU tracks your vocabulary size) at your level. The videos come complete with Chinese (Pinyin and characters) and English subtitles so you can follow along. Everything is interactive too. If you are unsure of the meaning of a word, you can simply mouseover and it will show you the meaning. People currently in China who want to use FluentU to its full potential will need a VPN, since all of the videos are hosted on Youtube (which is blocked by the Great Firewall). For help choosing a VPN for use in China, you can check out our review here: What’s the Best VPN in China? Using these Chinese Youtube videos really lets you immerse yourself in the current internet / pop culture of China (and Taiwan!). You get to learn more slang or everyday phrases that you would not normally get in a Mandarin course. For instance, you can learn how to say Big Mac in Chinese, or learn lyrics to popular pop songs (impress your friends at KTV!). All important for your survival in China, of course! Aside from Youtube videos and video lessons there audio tracks that come with transcriptions and also flashcards that you can practice with. You can also make your own playlists and favourite videos for later viewing. Unfortunately not all the extra content is free. To get full access you need to upgrade from the free account to either the basic account or the plus account. The subscription cost is small so if you like FluentU you should definitely upgrade your account if you want to get the most out of it. 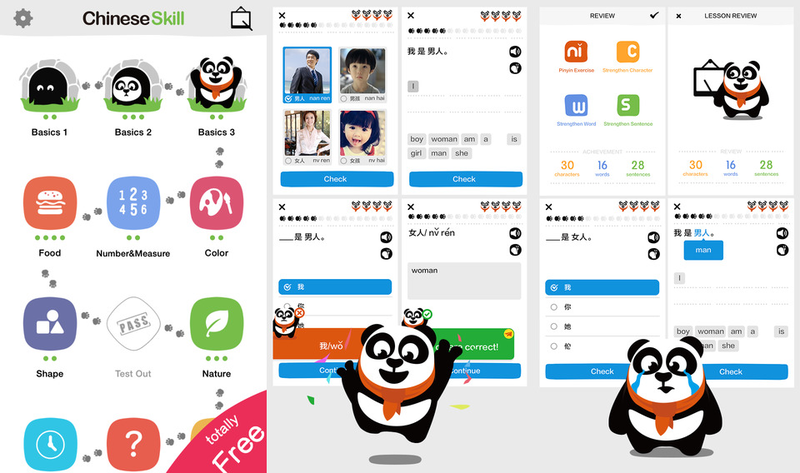 ChineseSkill will be familiar to anyone who has used Duolingo to learn a new language. The “Duolingo” method essentially introduces grammar and new words purely through context. At no point does the app explicitly tell your the meaning of a word or any grammar rules. Vocabulary at the beginning of each mini-lesson is introduced through selecting pictures that have the Chinese word written below them. Grammar rules are implicitly taught through simple multiple choice translation questions. By slowly increasing the difficulty of the questions, one learns without any laborious theoretical discussion of the language. A typical Chineseskill mini-lesson builds and builds upon previously learned grammar and vocabulary. Questions are easy at first — listening for Pinyin, single word translation or translation of sentences with word banks. But it gets progressively harder, eventually culminating in full translation from Chinese to English. The app is seamless and requires basically no instructions from start to finish. You can even opt to be tested on character writing, though I feel most learners of Mandarin will very rarely need this skill now that we have pinyin input on our smartphones. Being able to recognize characters and knowing the pinyin for a word is usually a good enough substitute for writing Chinese. Chinese skill lessons are meant to be done sequentially. Each lesson (or skill) explores a single by topics like Basics or Color. As you continue through the lessons, more grammar is introduced and sentences become more complex. There are a whopping 42 topics, with each topic having 3 – 6 mini-lessons. Each mini-lesson can take more than 5 minutes to complete meaning this app will take you 12+ hours to finish. ChineseSkill is also FUN. Throughout each mini-lesson you are given 4 pandas (or lives). For every mistake you make, you lose one panda. If you lose all pandas you have to start again. At the end of a completed mini-lesson, your score is shown as a percentage ranking (i.e you did better than 87% of all people who completed this lesson) which makes it kind of competitive and pushes the player to try and outrank everyone else. Chineseskill is available for both iOS and Android. This makes it super convenient. Since every mini-lesson takes about 5 minutes to complete, it makes it a great edu-game to play to fill in those little gaps in your schedule like waiting for the bus or travelling on the subway. After you complete some lessons you can go back and review them or use the practice mode to test vocabulary or sentences. I highly recommend this app and have almost finished all 42 lessons. I feel that my Chinese language abilities have improved quite a bit by using this app and I hope you find it as enjoyable as I did. It’s free so download it now! Finding a personal tutor to learn Chinese can be very useful for beginners, especially when learning pronunciation and tonality. While there are many opportunities to find a local tutor in China, you can also consider finding an online Chinese tutor. An online tutor saves you the hassle of travelling to each lesson and offers greater flexibility when traveling. TutorMandarin also offers a free 50 minute trial lesson / language evaluation. As with any learning strategy, consistency is key. 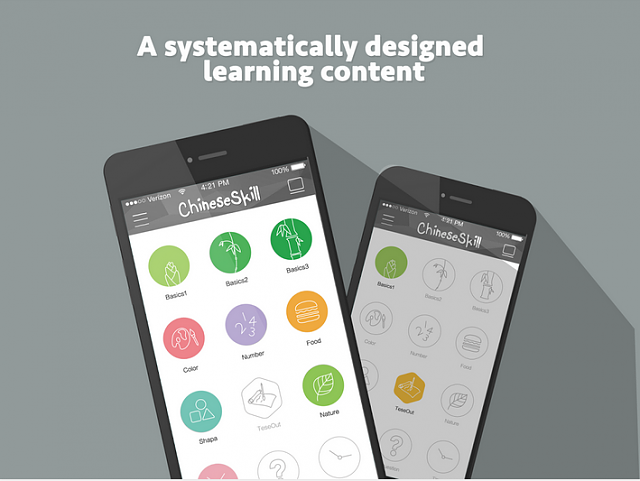 Try to spend some time with some of these web/mobile learn Chinese app methods and see which one works for you! If you have any other suggestions for free apps to learn Chinese, please leave them in the comments below. Happy Learning! Rachel Mok is a Canadian expat and tech journalist living in Guangzhou, China. Her writing has been featured in e27, Global Sources, and ChinaHush. She writes about entrepreneurship, travel, and life in China at Startup Living China.